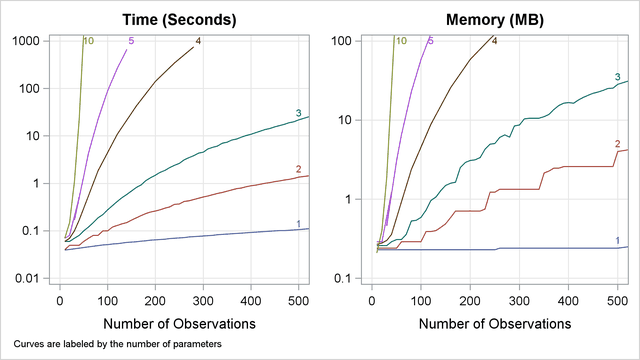 The memory needed to fit an unconditional model is approximately bytes, where is the number of parameters estimated and is the number of observations in the data set. For cumulative response models with more than two response levels, a test of the parallel lines assumption requires an additional memory of approximately bytes, where is the number of response levels and is the number of slope parameters. However, if this additional memory is not available, the procedure skips the test and finishes the other computations. You might need more memory if you use the SELECTION= option for model building. The data that consist of relevant variables (including the design variables for model effects) and observations for fitting the model are stored in a temporary utility file. If sufficient memory is available, such data will also be kept in memory; otherwise, the data are reread from the utility file for each evaluation of the likelihood function and its derivatives, with the resulting execution time of the procedure substantially increased. Specifying the MULTIPASS option in the MODEL statement avoids creating this utility file and also does not store the data in memory; instead, the DATA= data set is reread when needed. This saves approximately bytes of memory but increases the execution time. If a conditional logistic regression is performed, then approximately additional bytes of memory are needed, where is the number of events in stratum , is the total number of strata, and is the number of variables used to define the strata. If the CHECKDEPENDENCY=ALL option is specified in the STRATA statement, then an extra bytes are required, and the resulting execution time of the procedure might be substantially increased. Many problems require a prohibitive amount of time and memory for exact computations, depending on the speed and memory available on your computer. For such problems, consider whether exact methods are really necessary. Stokes, Davis, and Koch (2000) suggest looking at exact p-values when the sample size is small and the approximate p-values from the unconditional analysis are less than 0.10, and they provide rules of thumb for determining when various models are valid. A formula does not exist that can predict the amount of time and memory necessary to generate the exact conditional distributions for a particular problem. The time and memory required depends on several factors, including the total sample size, the number of parameters of interest, the number of nuisance parameters, and the order in which the parameters are processed. To provide a feel for how these factors affect performance, 19 data sets containing Nobs observations consisting of up to 10 independent uniform binary covariates (X1,...,XN) and a binary response variable (Y), are generated, and the following statements create exact conditional distributions for X1 conditional on the other covariates by using the default METHOD=NETWORK. Figure 53.11 displays results obtained on a 400Mhz PC with 768MB RAM running Microsoft Windows NT. At any time while PROC LOGISTIC is deriving the distributions, you can terminate the computations by pressing the system interrupt key sequence (see the SAS Companion for your system) and choosing to stop computations. If you run out of memory, see the SAS Companion for your system to see how to allocate more. You can use the EXACTOPTIONS option MAXTIME= to limit the total amount of time PROC LOGISTIC uses to derive all of the exact distributions. If PROC LOGISTIC does not finish within that time, the procedure terminates. Calculation of frequencies are performed in the log scale by default. This reduces the need to check for excessively large frequencies but can be slower than not scaling. You can turn off the log scaling by specifying the NOLOGSCALE option in the EXACTOPTIONS statement. If a frequency in the exact distribution is larger than the largest integer that can be held in double precision, a warning is printed to the SAS log. But since inaccuracies due to adding small numbers to these large frequencies might have little or no effect on the statistics, the exact computations continue.